L'Occitane Shea Butter Ultra Gentle Moisturizer is specially formulated to strengthen and protect sensitive and normal to dry skin. Unrivalled comfort, from a formula enriched with shea butter (8%). Skin is nourished, supple and comfortable. Ultra-gentle care, thanks to the calming and soothing action of liquorice extract and alpha bisabolol extracted from candeia oil. Redness is reduced and skin is soothed and relieved. Double protection against dryness and harsh conditions, thanks to protecting shea concentrate and skin fortifying prebiotics (natural sugars derived from wheat and beetroot). This beauty care helps to stimulate skin's natural defences for visibly better protected skin. The skin is soothed and less reactive. Its natural defences are stimulated, for visibly stronger, more resilient skin. With its light, fluid texture, L'Occitane Shea Butter Ultra Gentle Moisturizer is a year-round skincare essential! 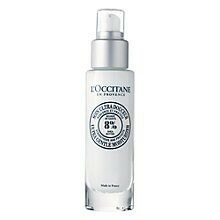 Use L'Occitane Shea Butter Ultra Gentle Moisturizer morning and evening, on face and neck, on clean and dry skin. I received a 15ml sample of this moisturiser, and it really suited my sensitive skin. It's a shame that it's been discontinued, but hopefully L'Occitane will consider bringing it back. - A small amount goes a long way. A good facial moisturiser that soothes and moisturises sensitive skin. "I received a 15ml sample of this moisturiser, and it really suited my sensitive skin. It's a shame that it's been discontinued, but hopefully L'Occitane..."